Winter. Cold. Snow. Suffering. 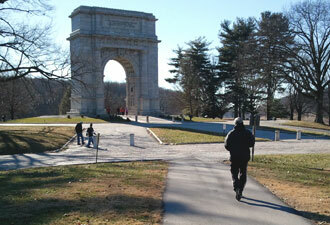 These elements come to mind for many people when they think of Valley Forge. And of course, strength, survival, and spirit. These powerful words are often spoken here and evoke strong emotion. Come to Valley Forge National Historical Park and you will come face to face with the story of General Washington's winter encampment of 1777-78. Power of place is a term to be reckoned with when you stand on a rise on the outer edge of the park. Take in the 360-degree view and contemplate how Valley Forge became the temporary home to a disjointed family of soldiers who became an effective fighting force that went on to win the war. A natural triangle of defense made up of ridges, mountains, and waterways demonstrates why this particular piece of land was a perfect place for hunkering down 12,000 soldiers for six months in the third winter of the bold rebellion against the mother country. 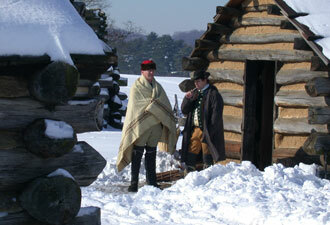 As a winter visitor to the park, you will find many ways to experience the legacy of Valley Forge. When the temperature drops, the wind blows, and the snow flurries, the park marks the beginning of a season of celebration and commemoration of this chapter of the American story, from the 1777 march in to the soldiers' march out the following June. Annually on December 19, in honor of the day the soldiers arrived, neighbors and visitors stroll with park rangers and volunteers along candle-lit walkways to the historic encampment's log city for demonstrations of military and civilian life. Every weekend throughout the winter, and daily in spring, summer. and fall, staff dressed in historical attire share living history discussions. Many a riveting tale about sogering, as Private Joseph Plumb Martin called the soldiers' life, can be heard around the campfire. On the first Saturday, January through April, children are invited to join the continental army and drill with wooden muskets to General Von Steuben's commands. Over Presidents' Day weekend the park continues a 100-year tradition of co-hosting with the Boy Scouts of America the annual Pilgrimage. Each year 3,000 scouts gather to participate in learning stations from Muhlenberg's Brigade to Artillery Park. Also in February come to the grand birthday party for General Washington in honor of the celebration Martha hosted when George turned forty-six at Valley Forge. Watch the General cut the cake with his sword. More special events throughout the year showcase untold stories of soldier life, the women of Valley Forge, and the diversity of the continental army. Every season features historic programming, scenic wonders, and the exhilaration of vigorous or relaxing hikes along twenty-eight miles of trail through 3,500 acres of unparalleled beauty. 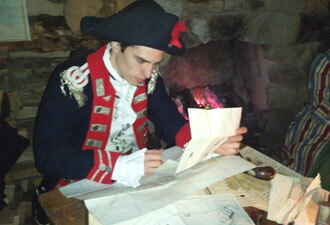 Any time of year is a perfect time to visit Valley Forge, experience history, and participate in special events. But a winter visit takes you back in time to catch the spirit of a remarkable story.